Boy howdy, have we ever been busy lately! Too busy to blog, apparently, but I will start making up for that now. CoreCon 2012 was the second year of the KEEP con suite. 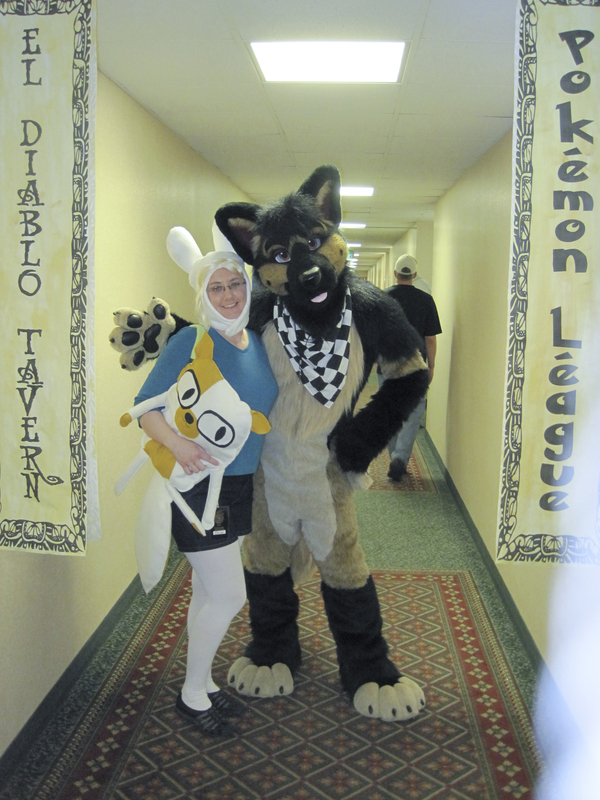 If you are unfamiliar with fan conventions a con suite (or hospitality or party suite) is basically a party room, usually with a theme, that is open to the attendees of the convention. It may be hosted by the convention itself, or by fans who just want to throw a party. Decoration: We used Scene Setters wall coverings this year, which we attached to the wall with blue painters’ tape. We also had a gas mask and warning posters for that special extra touch. That part was not too complicated or expensive. When planning for decorations consider how you will attach them to the walls. Do not use anything that will damage wallpaper or leave holes in the walls or ceiling. You are liable for any damages. Also, be aware of any impediments like smoke alarms, a/c unit, pictures that won’t come off the wall. You can’t cover smoke detectors or sprinklers. Activities/Entertainment: Friday night was the puppet show, which also sort of falls under the “decor” category. We were able to borrow a puppet stage from the library, used a backdrop stand to help support it and hung up muslin left over from last year’s circus tent theme as a curtain. 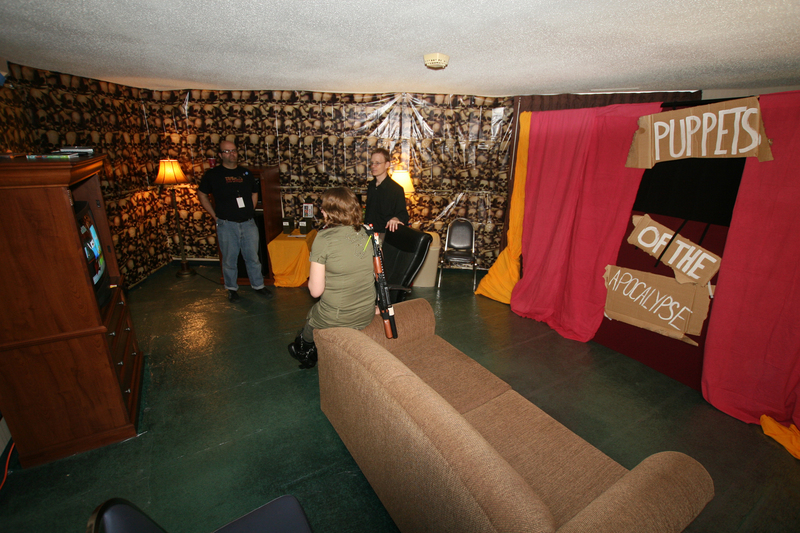 Saturday night we removed the puppet stage and set up a movie screen in its place, running apocalypse-themed films. When planning for activities and entertainment think about if this is something you would like to see or do yourself, and if it would keep you in the room. Refreshments: We had Kool-Aid, candy, and homemade cookies. When planning for food and drink consider what is practical and if you have the necessary facilities to pull it off. You will probably be lucky to get a mini fridge and microwave in the room. You may not be allowed to have hot plates. Find out ahead of time. Typically plan to have a serving for every expected attendee of the convention. Yep, that’s a lot. Some people will not show up, and others may take seconds. It should even out. Chocolate goes fast. People love puppets. I was really surprised to find we had a full house for all six shows. Rock on. People are less interested in homemade cookies than we expected. We thought we’d be bribing people with the cookies in hopes they would stay for the show. It was the other way around. We did a panel at CoreCon 2012 on this subject, and I would like to say a big THANKS to Karen for writing the outline, and to House, Carrie and Kim for contributing. The following comes from that panel. Find out what kind of space you are working with (talk to the con chair) and what is available – chairs, tables, etc. See if you can get room dimensions. Find out what the Con expects/requires from you. Determine who you can actually count on to help before, during and after the con. Plan for breaks for everyone involved. Figure out your budget. If it will be extravagant consider spreading the cost out over the course of many months. Look at all of your resources. What do you have around your home or work that already fits into your theme? Do any members of your group have talents for sewing, designing, building, etc that you can use? Determine how you will transport and store decorations and props, before and after the con. Will it fit through the door? Decide if you will have commerce (selling stuff) in your room. At some cons this is prohibited, and there may be tax codes or health codes to deal with. I am personally biased against commerce because I think of it as a party for your 500 closest friends, not a business opportunity. That being said, if you are selling something akin to a meal, I can’t really fault you for wanting to cover some of your expenses. Use your best judgement. Decide if you will have alcohol. YOU CANNOT CHARGE FOR ALCOHOL. And I wouldn’t recommend selling cups and then “giving away” the alcohol. You, not the con, are responsible for checking IDs and badges so be prepared for that. Giving alcohol to a minor is a big deal. Plus it is expensive. But it is also a party and will get more traffic in your room, so choose wisely. Test all recipes ahead of time. If possible, practice set up and tear down, and a run-through of any activities. Design an ad and fliers. Consider a tip jar. You won’t make your money back, but it’s worth a shot. Make a checklist of every single little thing you will need, like remote controls, batteries, lights, napkins, cups, serving utensils, doorstop, etc. Make sure you know the check-in and check-out times of the hotel. Get in as early as possible. Be aware of badges. Non con-goers should not be in your room. Check all IDs if you have alcohol. If you have food and drink consider getting self-adhesive painter’s plastic for the floor. It has paid for itself in our suite for sure! As I said earlier, you are liable for any damages to the room. We bought ours at Lowe’s, but I can’t find it on the web site. It’s in the flooring section. Make sure to schedule breaks for everyone involved so you don’t miss the rest of the con, and you can check out all the other excellent suites! Get a contact for security in case you have any trouble, and do it BEFORE you open up the room. Don’t take it personally if you don’t get much traffic. Some days are good, some aren’t. Maybe nobody was in the mood, or another suite stole your thunder. It happens. Taking into account the above, do this for yourself first and foremost. If nobody else shows up at least you will have fun. Be realistic about how much time you actually have to dedicate to this project, both before and during the con. 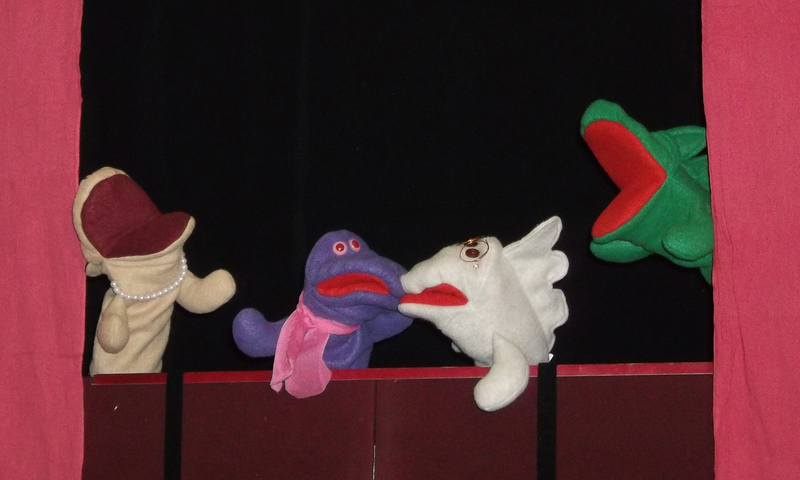 When we started out with the puppet show idea we were talking about doing a different show every half-hour all night. Eventually we got real and only did hourly shows that lasted about 5-6 minutes. Don’t burn yourself out. As I said earlier, this is not a money making venture. We figured we spent around $700 amongst the four of us over the course of the year leading up to CoreCon 2012. Much of that expense was for things that we would have bought eventually anyway (portable movie screen, for instance). We had to pay for the room, decorations, food and drink. We also have a lot of puppets left over that we may never use again, and we had a prize drawing each night Friday and Saturday. We got $6 in tips. You do NOT have to spend a crapload of money on a suite! You just have to get creative. Even though it was a lot of work we had a blast this year, and we won second place for our suite! That means we get a full-page ad in next year’s program! Now we have to figure out how to top this year’s success in 2013. I’m sure we’ll sort something out in our spare time. 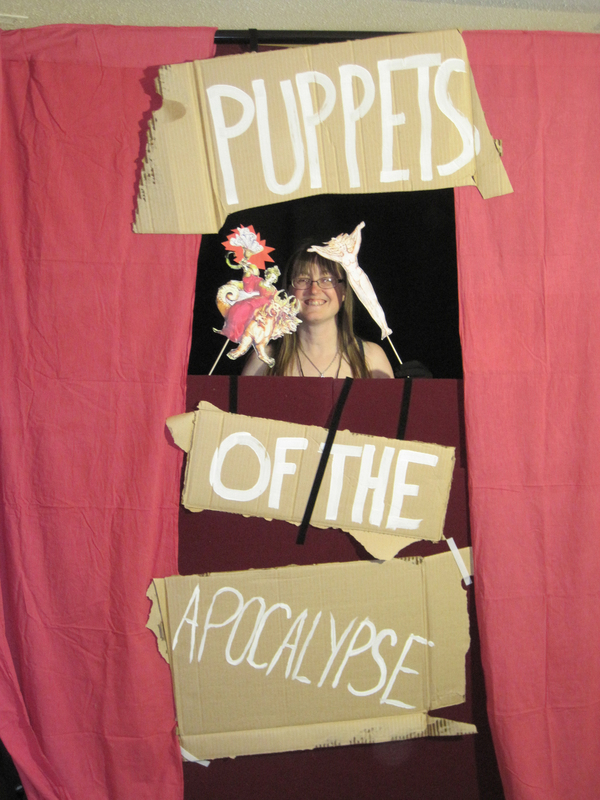 Props to Puppets by Margie for our custom-made puppets! If you have any questions or suggestions please put them in the comments.